Halloween has come and passed, and now it’s on to Thanksgiving and then Christmas! The stores here have already started setting out their Christmas merchandise. I have a feeling that these next couple of months are going to go by very quickly! 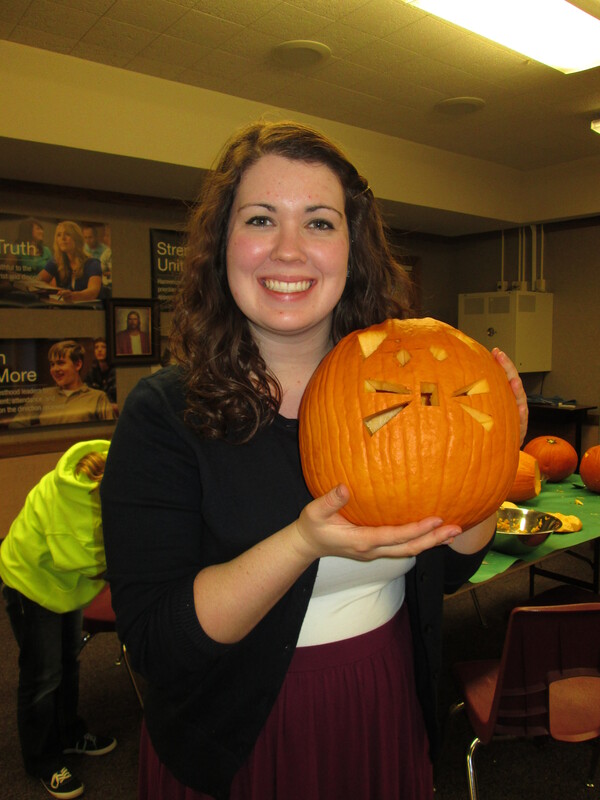 Last Monday night for FHE, I got to carve a pumpkin for the first time in two years! I made a little kitty face. The more important part of carving pumpkins however is collecting the seeds. Thankfully another member of the ward, Derek, also loves to roast them so we worked together to sort them and cook them up in the oven. They were delicious! Tuesday was the start of the rain and the clouds. The clouds haven’t gone away all week! Tuesday night was successful though because we got to contact a less active referral, and he was pretty cool. Not really interested in coming back to church, but we had a good lesson with him. So something we do is that when we contact a referral or visit someone, we always knock on the door of at least one of their neighbors. Well, Tuesday night we tried to contact a girl form the ward and it turns out that she moved. So we knocked on her neighbor’s door, and he was interested! He had had a roommate in the past who was a former member of the RLDS church, so he knew a little about that and was curious to learn about the LDS church. Near Missoula, there is a town called Pinesdale where a ton of fundamentalist polygamists live… we get lots of questions because of that, haha. The middle of the week is kind of a blur right now, and all I can really remember is teaching a bunch and getting ready for our table on Friday. 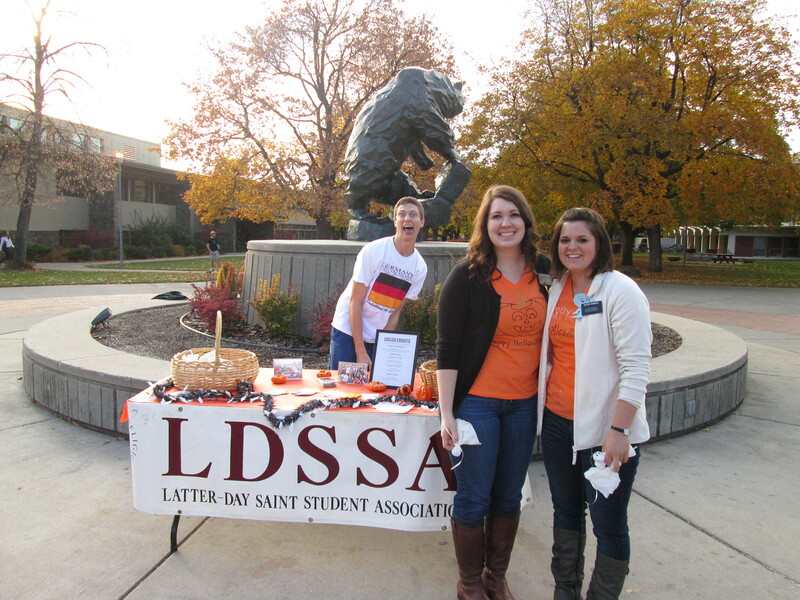 So yeah, we did a table outside on campus on Friday for Halloween! We made little sucker ghosts and attached an invitation to FHE and handed them out to students. We gave out close to two hundred suckers! We shall see tonight if any of them show up. 🙂 I’d say about half of the students on campus were in costume, which was amusing to watch. Funny story from the table: so we were watching this kid ride his bike, and his cape was just flapping behind him. Then, his cape got stuck in the tire and he came to a halting stop (he wasn’t hurt, just embarassed, haha). Without missing a beat, one of the members of our ward yells out in their best “Edna” from the Incredibles voice, “NO CAPES!”. We all died laughing. Apart from the table, our Halloween was fairly relaxed and nice. We helped some members of our ward set up for the ward halloween party after we got done with the table on campus. President Mecham put all of us on lock down after 6pm. The members we live with, the Hendersons, went out to dinner so we stayed and handed out candy for them. It was so fun! We also got to watch one of the two approved movies in our mission- Ephraim’s Rescue. I’d never seen it before, and I really enjoyed it! It was nice to get to just stay in and watch a movie, not gonna lie. 🙂 I think Sister Randall and I ate more candy than we actually handed out though… oops! Haha. On Saturday during personal study, I finished reading Jesus the Christ! It took me four months to read it by reading it for fifteen minutes a day during studies. As my understanding of my Savior has grown, my love for him has also grown. I bear witness that Jesus is the Christ, the Messiah, and the Son of God. I have felt this strongly confirmed to me at several times throughout my reading. After studies, we did some service for the members we live with and raked their front yard leaves for them. 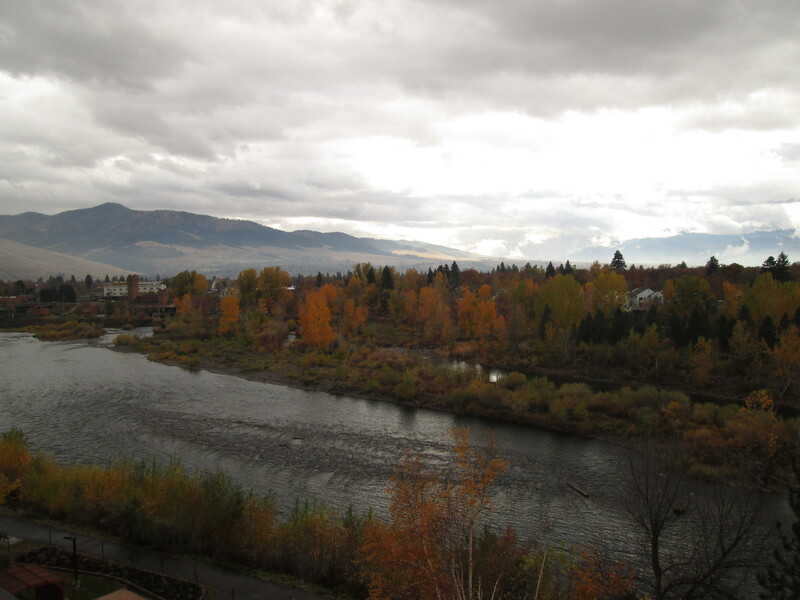 The nice thing about Missoula is that you don’t have to bag them! All you do is rake them into the street, and then there is a set day where they come by and scoop them up and take them to a landfill. Pretty nice! Bro. Henderson told us that we were an answer to his prayer by doing that for them. 🙂 We taught a ton this weekend, and we are seeing a lot of progress from our investigators. Adriana came to church again with her boyfriend, and they really enjoyed it! The boyfriend, Michael, participated a ton in Sunday School. 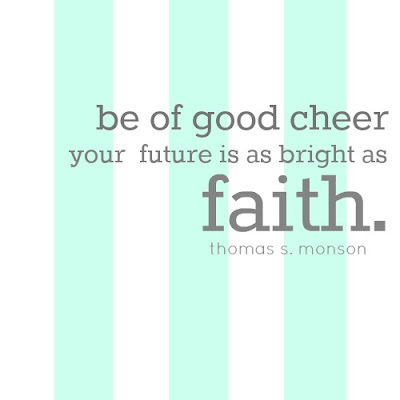 We had the Spokane, WA Temple President and his wife there at church with us and they gave an awesome third hour address. 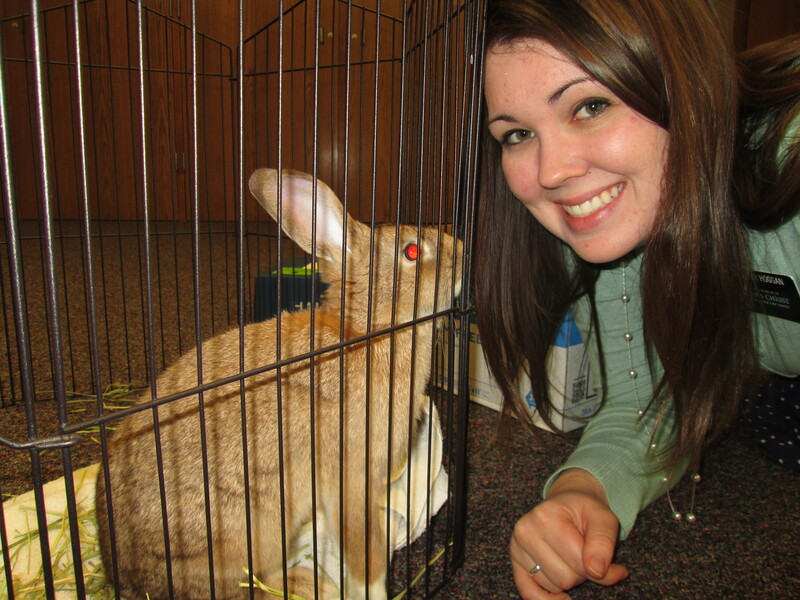 I love lessons where your investigator brings their bunny… I love single’s wards! Haha. Bunny selfie. So Daylight savings in super messing with my sleep schedule! I keep waking up at 5:23am because that’s when my body is set to wake up. And we were both dragging all night, especially during planning because it felt so late! It’s a challenge with it getting dark so early too. We’ve pretty much decided that we aren’t going to do anything on the streets after 8pm, so we’re trying to get as many set appointments for that time as possible. Love you all so much! Thank you for your prayers and support. Have a happy week! !